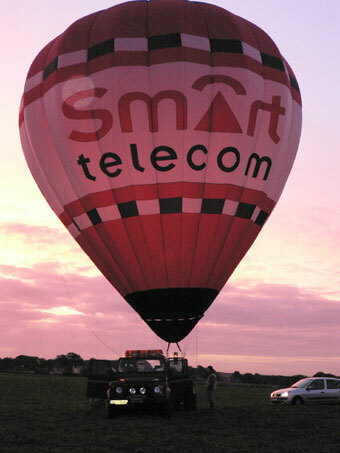 Early in 2005, two balloons were ordered from Lindstrand Balloons, a 260A (260,000 cubic feet G-SMRT) for our AOC passenger flights and a lightweight 31 (31,000 cubic feet EI-DJZ), both promoting Smart Telecom, an Irish telecoms provider. The 31 was purchased primarily to allow an attempt at the female AX-4 altitude, distance and duration World Records. As the 35th Irish National Ballooning Championships were due to be held near Virginia, Co. Cavan at the end of September, this timeframe was also chosen as being the ideal time to make one or more of the record attempts. 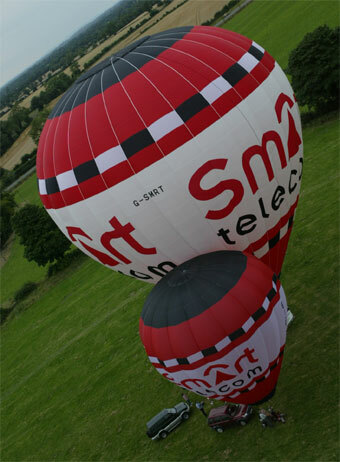 The 31 was also successfully used in TV and cinema advertising for the telecoms company, making the balloon known to just about all of the Irish public. The long-term forecast for the end of September proved unsuitable for making an altitude attempt, so the focus turned towards the distance and duration records, with Pauline Baker, a balloon pilot from Trim, Co. Meath at the helm. Daily calls to the Met Eireann offices in Shannon were unable to come up with a suitable slot until Sunday 25th, with the promise of a moderate north-westerly allowing us to launch in Co. Sligo with a prospective landing towards the south-east. A call was made to long-term competition and records observer, Rita Boyle, to come across to Ireland for the Championships to act as the official FAI observer for the attempts. 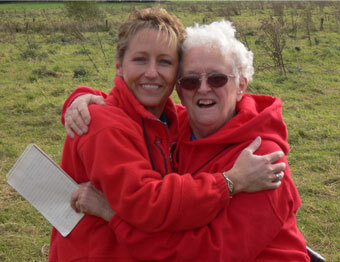 Rita duly arrived on Saturday 24th and was whisked off westwards towards Sligo. The met forecast we received on the Saturday evening was still promising, as we sat around the log fire in Markree Castle, a fitting start to the planned flight. The forecast was for a breezy morning with decreasing winds around lunchtime. We therefore planned for a launch around noon, landing later in the afternoon in the calmer winds. Sunday morning dawned bright and clear but by 10.30 the cloud has built up and the rain started! A subsequent call to Met Eireann gave us an "It'll be grand" for the afternoon, although the conditions might be more stable slightly further south. With this information, we hit the road and headed down to Co. Galway aiming to be in the air by 1pm at the latest. It was fairly obvious to the novice meteorologist that the conditions were far from "grand" as we passed Knock International Airport (actuals of 19kts gusting 29kts) with horizontal rain. We sat it out in both Galway and then Athlone with little or no improvement in the wind conditions. We then drove back to Dublin, disappointed, with no obvious slot in the forthcoming days and the prospect of sending Rita back to the UK without having the opportunity to fly. As the week went on, with the many ballooning visitors to the Championships frustratingly watching the skies, a possible slot developed for the Thursday morning. The slight doubt was that the forecast was just about identical to the one the previous Sunday. As the day approached, it looked like the slot might really be there, so we travelled across to Co. Galway on the Wednesday evening. A call was made to ATC in Galway airport to gain permission to fly from inside their CTR and this was granted. We therefore set up camp that night in Athenry, Co. Galway at the new Raheen Woods Hotel, ideally having a suitable launch field directly opposite. After a 5.30am alarm call, we started to set up the equipment an hour before sunrise so that we could have the balloon in the air by 7.30am, as the forecast was for winds to increase in the afternoon. Rita sealed and attached the barograph to the balloon as we set up the rest of the equipment that was to be carried on the flight. This included a Flytec 4020 Professional recording Variometer/Altimeter. This device also acts as an FAI-approved barograph veriflying the primary barograph. More details can be found here. One notable piece of equipment was a GPS tracking device that was provided by KCS BV in Holland (www.traceme.tv). This allowed a Lat/Long position to be stored and sent to a server in Holland every 10 seconds on the flight and a photo, from a small remote camera, every 3 minutes (in the haste of getting the balloon rigged, the camera was inadvertently installed upside down on the burner frame!). The actual log of the flight can be seen at www.balloons.ie/recordlog.html. The GPS positions and photographs are transmitted by the TraceMe unit, using a built-in GSM/GPRS capability, to a server in Holland. 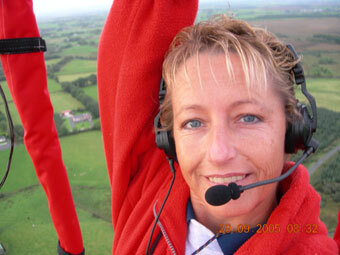 This meant that we could find Pauline's position at any stage of the flight using a mobile phone browser. Two airband transceivers were loaded together with water and food for Pauline. All of the equipment was checked and the balloon prepared for inflation. 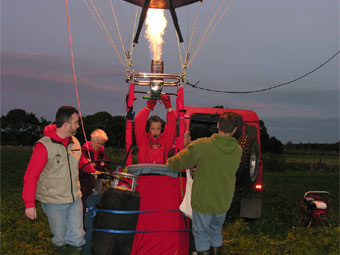 With the balloon inflated and ready to go, Pauline lifted off at 7.31am into the lightening Galway skies. With a heavy fuel load, the initial stages of the flight took her NE before veering more towards the E or ENE at 500 feet at a leisurely rate of around 10 knots. Having attended a charity function a week earlier in the town of Moate, Co. Westmeath, where 7 balloons flew for a children's charity, the media in the area were very keen to hear of Pauline's progress. The organiser of the charity event, Sargeant Pat Keegan of the local Garda, was also personally interested in the flight. As luck would have it, Pauline flew directly over the region and gave a live radio interview while doing so. As the retrieve convoy passed along the N6 through Athlone and Moate, it was joined by two marked Garda squad cars, the first with Pat Keegan at the wheel! 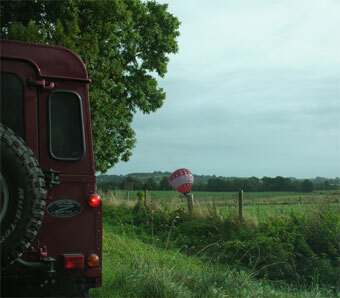 Pat headed up the convoy and escorted us towards Mullingar in pursuit of the balloon, now on its last tank of fuel. As the retrieve convoy travelled over narrower and narrower country lanes, it eventually met a locked pair of wrought iron gates with a huge field beyond. As we pulled up, Pauline came into the field and landed at 11.34 and 55 seconds (flight time of 4hrs 2mins and 55secs) comfortably beating the existing World duration record of 2 hrs 40 mins, set in 1975 by an American pilot. The distance covered was 91.05km, again, comfortably beating the existing record of 74.74km set in 1998 by another American pilot. A key was found for the gates and the balloon and pilot were retrieved, after the obligatory champagne. 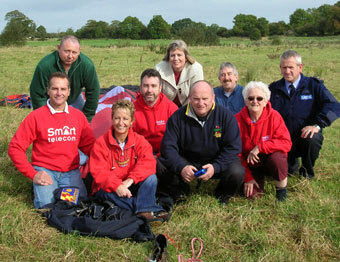 The same morning, 30+ balloons flew from the Championships in Co. Cavan although with much stronger winds aloft. The whole team were delighted with Pauline's achievements and look forward to the next one!!! Watch this space.